We urge patients of all ages to see our Kansas City, MO, dental team for routine checkups. These visits actually improve oral health and enable our team to help you avoid the onset of serious complications. In today’s blog, we’re looking at the benefits of a dental exam and explaining what goes into a checkup. The American Dental Association recommends one every six months for people of all ages, starting at around age three. We agree. During these visits, we will employ advanced technology, such as digital x-rays and intraoral cameras, to obtain a detailed picture of your smile, including the jaw and oral structures. With an exam, we have the chance to identify the presence of trouble early and treat the issue before you develop pain or require more extensive treatment options. We typically look for the indicators of tooth decay, dental infection, gingivitis, and gum disease. We also watch for the wear and friction that could point to TMJ disorder or bruxism (chronic teeth grinding). As part of our checkup, we will also look for lesions, sore areas, or areas with red and white splotches. These could often indicate a possible cancerous or precancerous area. By identifying oral cancer in the early stages, you increase your chances of a full recovery. In fact, one of the main reasons for oral cancer’s high mortality rate is the fact that the disease is rarely caught in the early stages. 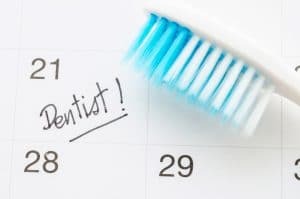 However, by attending a routine checkup every six months, you help keep your smile healthy and allow us to perform a thorough and precise screening. Along with the visual exam and oral cancer screening, we will also clean your teeth during your visit. A cleaning involves using a manual tool or an ultrasonic scaler to remove plaque and tartar from the teeth. A bacterial byproduct, plaque buildup often erodes tooth enamel and inflames the gum tissue, increasing the risks of cavities and gum disease. By removing buildup, we help protect your oral health. In addition, the procedure also offers other benefits, such as brighter teeth and fresher breath. If you would like to learn more about our approach to preventive dentistry, or if you and your family need to undergo a regular checkup and cleaning then contact our team today. Let’s make 2019 the year you embrace a healthier smile! DO YOU NEED AN EXAM? If you need to have your smile examined, then contact our team. To learn more about our preventive dental care options, then schedule a consultation by calling Cosmetic & Implant Dentistry of Kansas City, MO, today at 816-897-4288. Let 2019 be the year you obtain a beautiful smile!